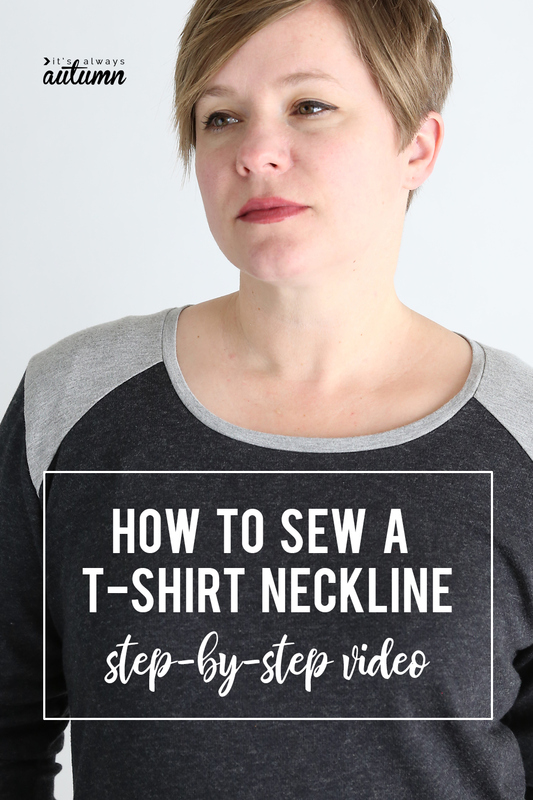 In today’s post: Learn everything you need to know to finish your t-shirts and other knit garments with a professional looking neckline. Nearly all of the patterns I share on the blog are designed to be sewn with knit (stretchy) fabric. That’s mostly because I really like to wear comfy knit fabrics (t-shirts for life! ), but it’s also because sewing with knits is easy. There’s rarely any darts, zippers, finicky fit issues, etc. Easy to wear, easy to sew. Find all of my free patterns here. But there is one part of sewing up a t-shirt or other knit garment that can be tricky: finishing, or binding, the neckline. To make sure you won’t be intimidating by this step in each of my patterns, I’m sharing two videos that walk you through each step of the process. 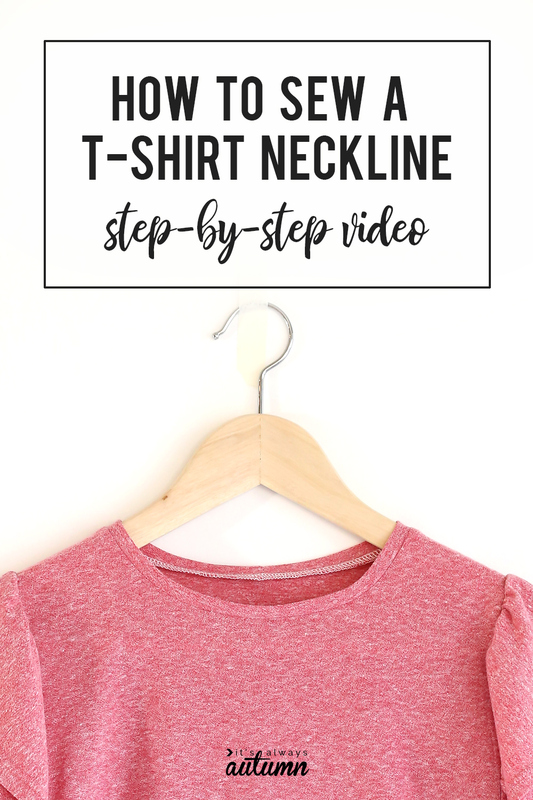 These two videos will show you exactly what you need to do in order to end up with a professional looking neckline on a t-shirt or other knit top or dress. The videos are each 8-9 minutes long because I wanted to be very thorough and make sure to show and explain each step. If you do not see the videos here, you are likely using an ad-blocker. If you disable it or whitelist this site, you’ll be able to view the videos. Each of my patterns will give you a neckbinding measurement. This is an approximate measurement for cutting out your pattern piece only and IS NOT the final length of the neckbinding. You will determine the final length using one of the two methods I showed in this video. Remember, you can find all of my patterns by clicking here. I went to the BIG fabric store and was so disappointed in the selection of knits appropriate for casual T shirt tops. I was ready to use your sleeveless pattern and I had to put it away. I wanted a floral with stretch for spring. Thank you for all your videos and patterns. I appreciate them. Are the links to the videos missing? I’ve clicked on everything I can see, but can’t seem to find the videos.